About 700 public safety personnel from 42 agencies controlled the crowds. 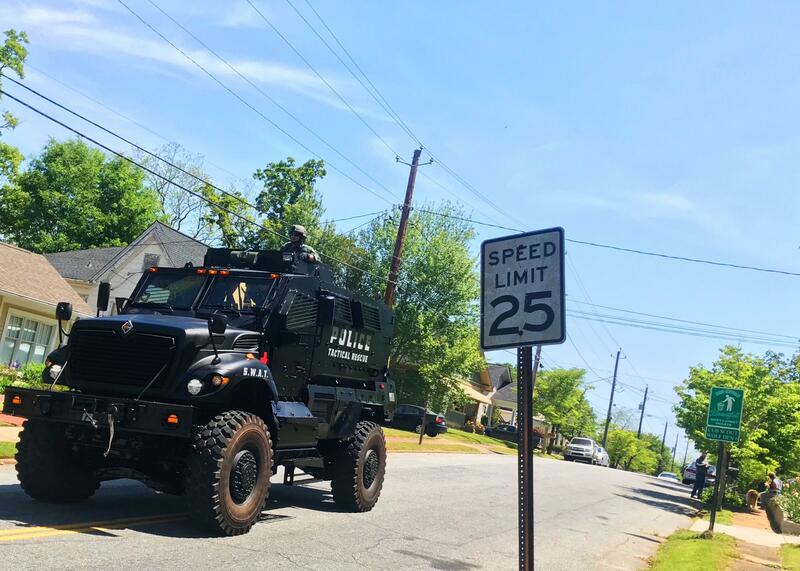 Armored vehicles rolled down Newnan's normally quiet residential streets. Many streets were closed to traffic for most of Saturday. 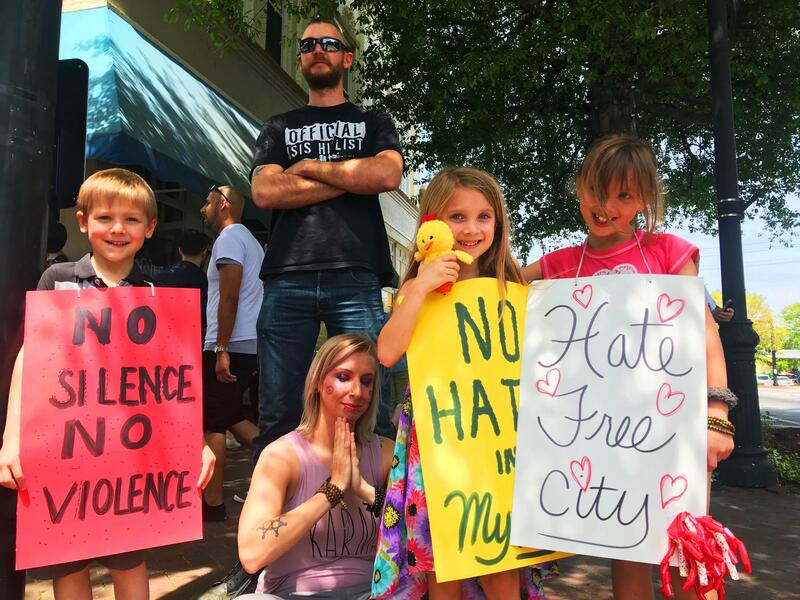 Brad and Ashley Strange brought their kids out to demonstrate on Newnan's historic square. 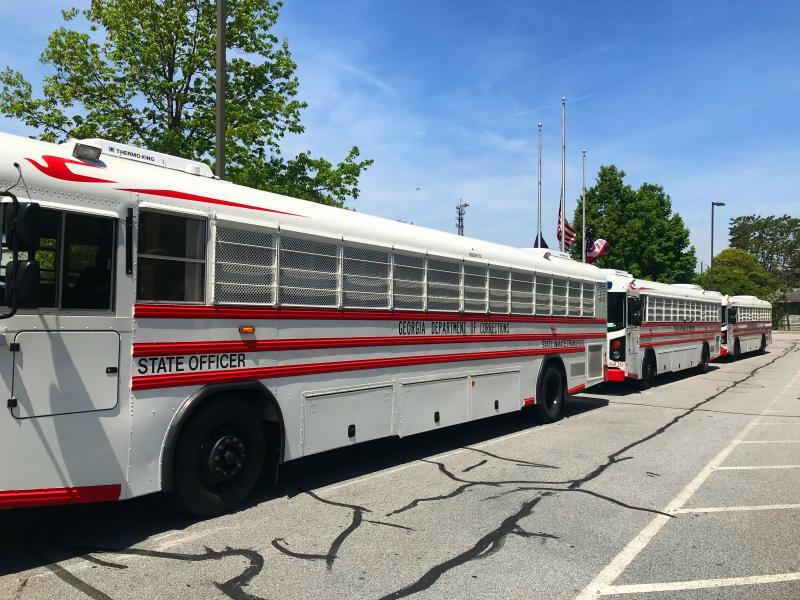 Georgia Department of Corrections buses were at the ready in case of arrests, a Corrections Officer said. 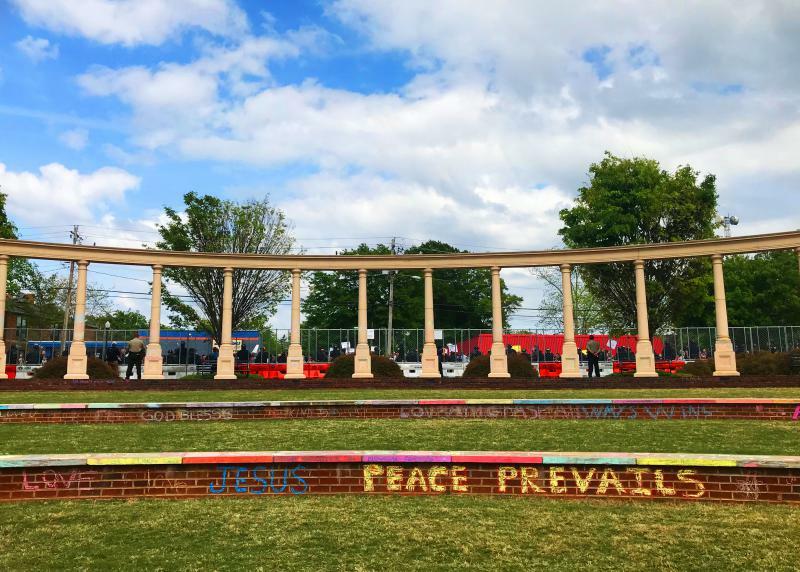 At least ten counter-protesters were arrested Saturday, CBS affiliate WGCL reported. The list extensive list of items banned in rally and counterprotest areas did not include loaded guns. 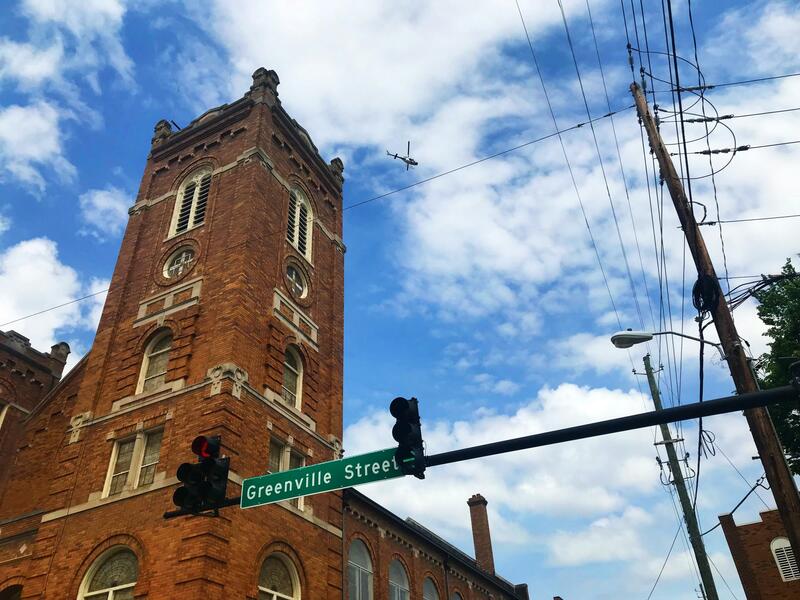 Police helicopters circled Newnan for hours on Saturday. 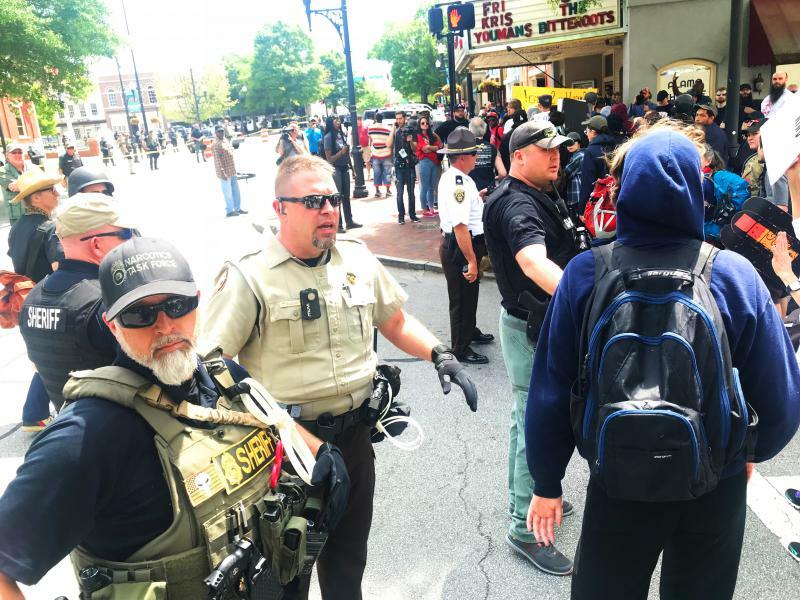 Georgia State Patrol in riot gear kept a 75 yard buffer between speakers at a National Socialist Movement rally in Newnan, and hundreds of counterdemonstrators. Police provided security for neo-nazi organizers. 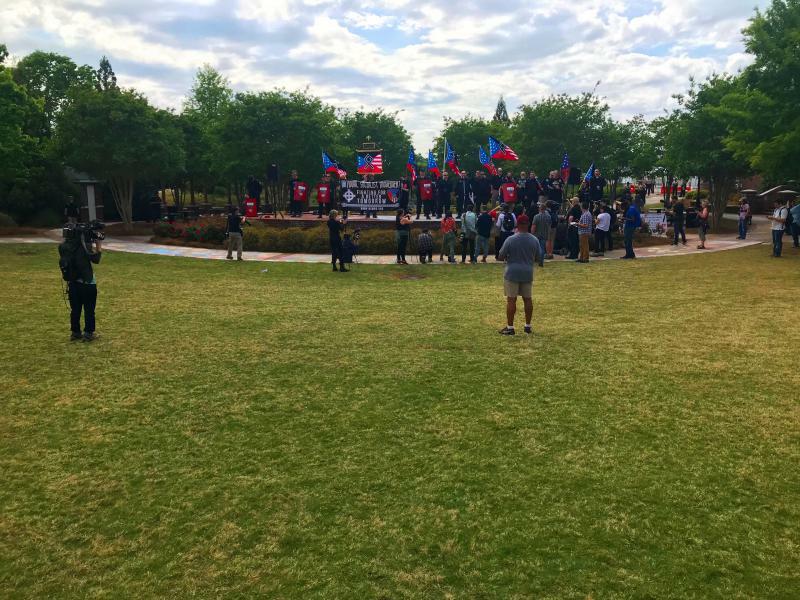 Officers didn't let anyone besides NSM organizers and credentialed media inside the park where the rally timed to celebrate Hitler's birthday took place. A crush of reporters interviewed NSM leaders at the group's rally. A member of NSM threw a Nazi salute on stage and shouted "Heil!" The group Atlanta Antifascists organized some of the counterprotestors. 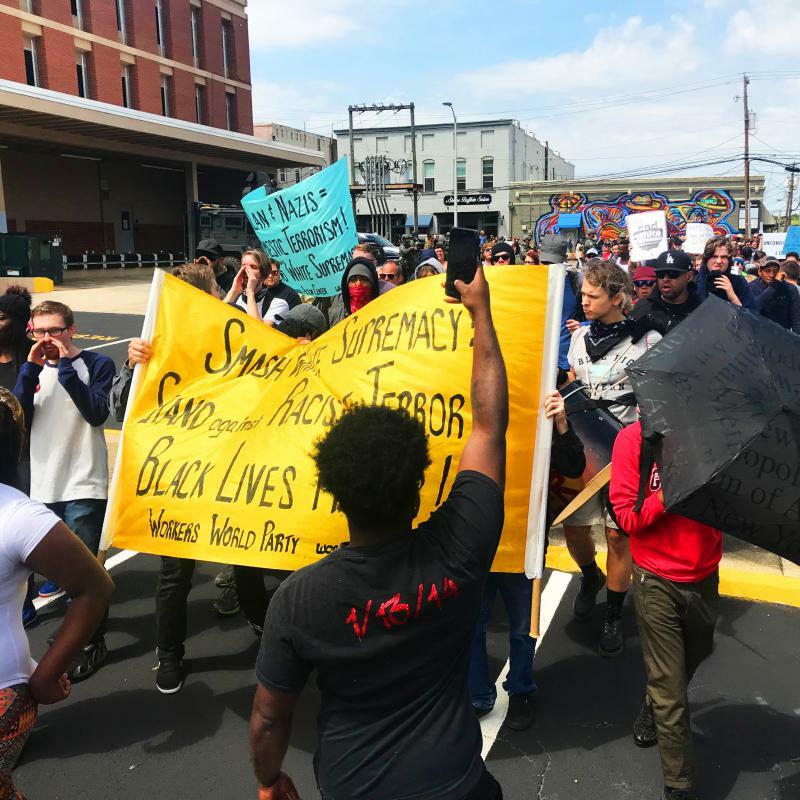 The marchers chanted "Cops and Klan go hand in hand," And: "We are peaceful, what the f*ck are you?" About 35 people represented neo-nazi causes on stage. No one but press and police got close to them. 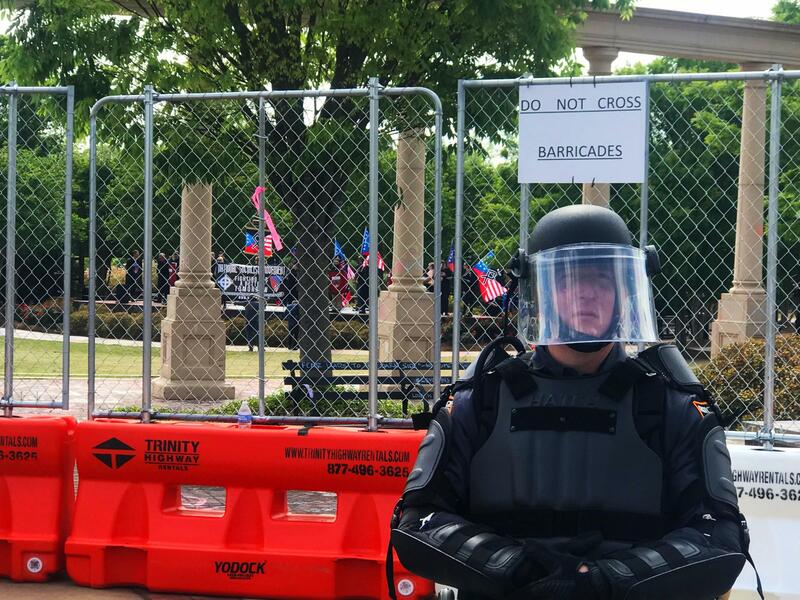 They carried shields, poles and other items prohibited for counterprotestors. The crowd outside the park waited hours from NSM leaders to show up. A view of counterprotestors from the neo-nazi rally in the park. Law enforcement demanded that this marcher in a blue hoodie remove his mask. 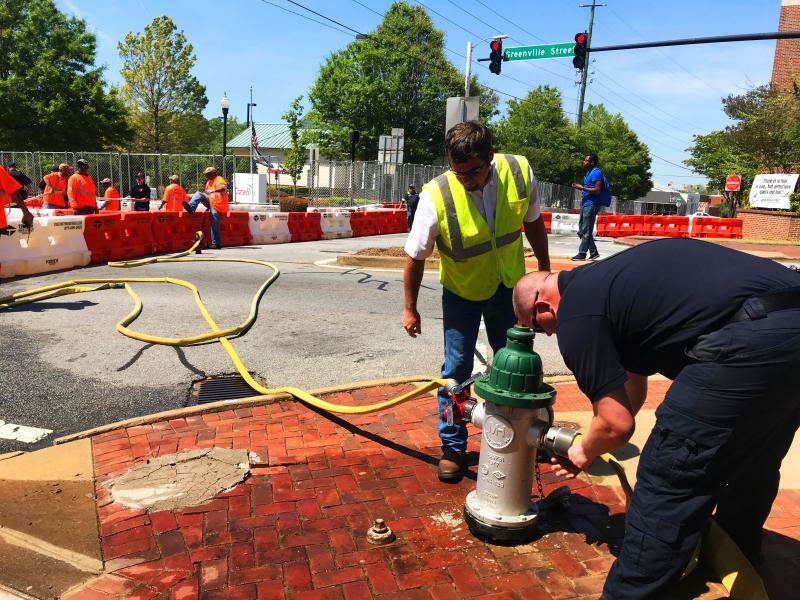 Public safety workers use a fire hydrant to fill up water barricades the City of Newnan rented for the weekend. 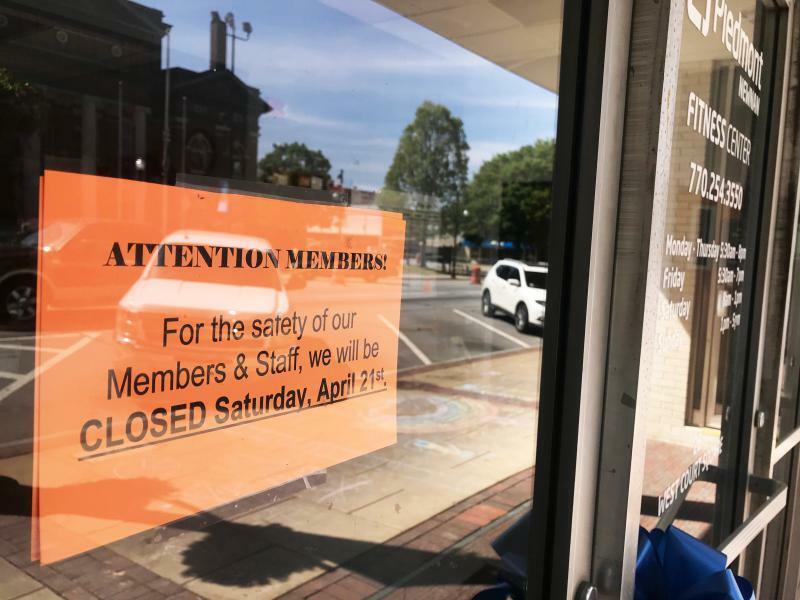 Many businesses in historic Newnan closed Saturday. 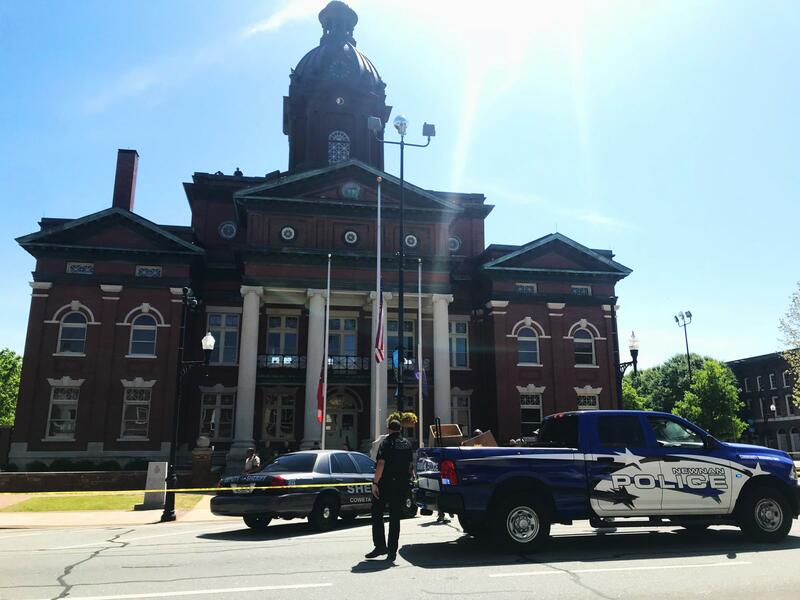 Law enforcement blocked access to the Coweta County Courthouse, which is ringed in Confederate monuments. 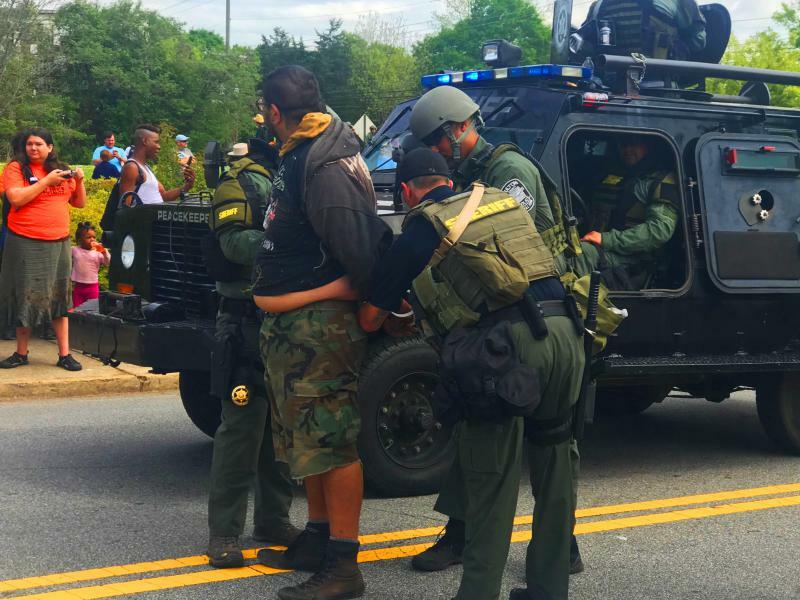 Newnan officials reported 10 arrests, no property damage, and no injuries. Hundreds of counter demonstrators outnumbered the roughly 35 members of the National Social Movement who showed up for a political rally timed with Hitler’s birthday. A member of the group paid $50 for a permit to use a local park. The city paid for public safety associated with the rally and counter protests. It hasn’t released that figure yet. 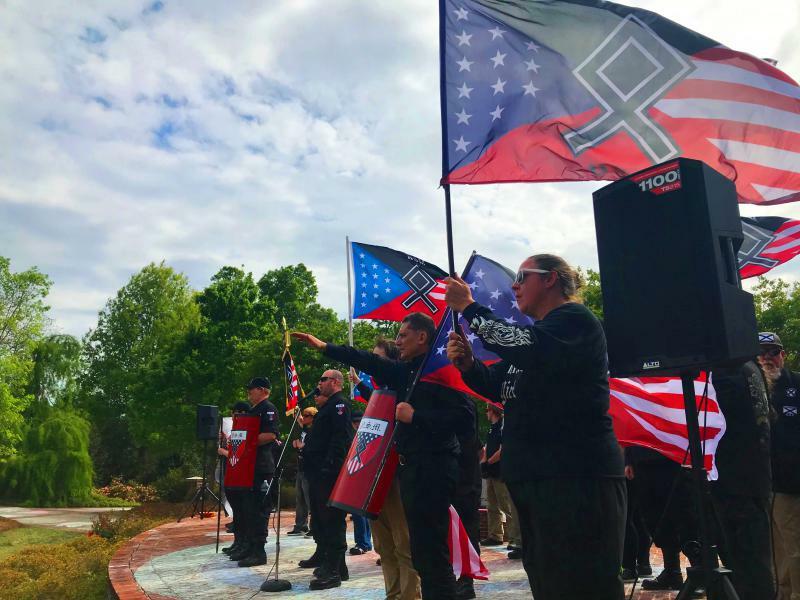 A League of the South rally in Murfreesboro, Tenn., last year cost the city and county about $350,000. Some locals are irked they’re picking up the tab. 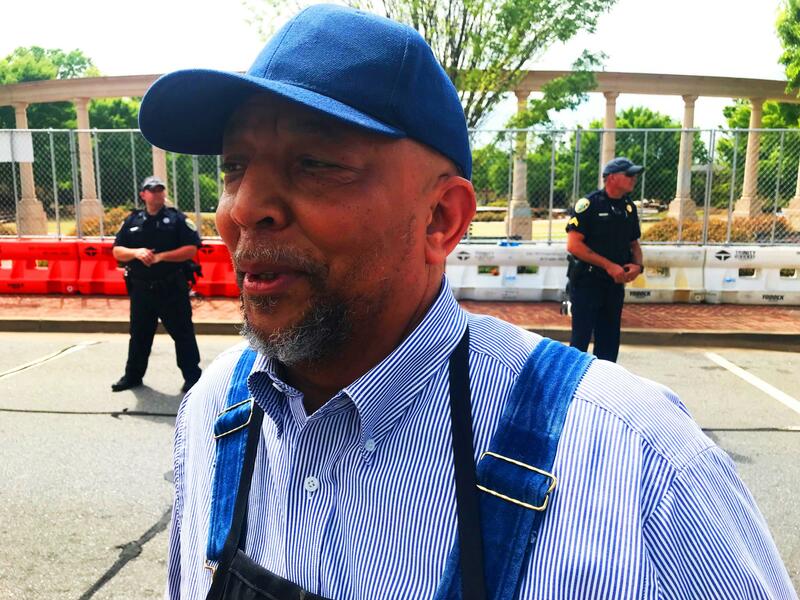 Stan Seldon owns a barbershop downtown and has lived in Newnan all his life. The city says it had no choice. 42 law enforcement agencies were mobilized to control crowds and keep opposing sides separated. The city’s historic district was heavily barricaded and several roads were closed most of the day. Officers blocked access to and guarded the Coweta County Courthouse, which is ringed with Confederate monuments. Police escorted NSM members in to the park, allowing them to carry shields and flagpoles. This came hours after counter protesters marched and assembled in a police-designated area with one security checkpoint. Everyone coming in to the counter protest area was searched. 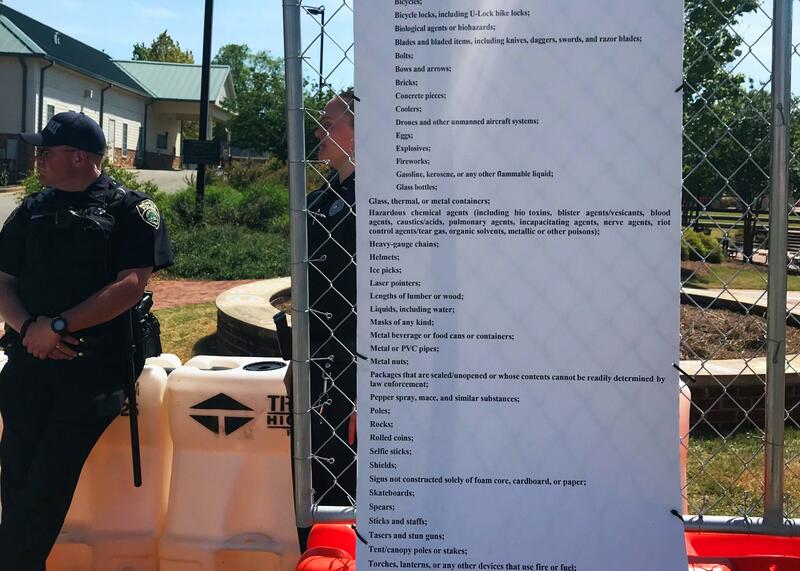 A detailed list of of banned items included a many possible weapons -- except for permitted guns. Georgia law protects the right to openly carry firearms in public spaces. 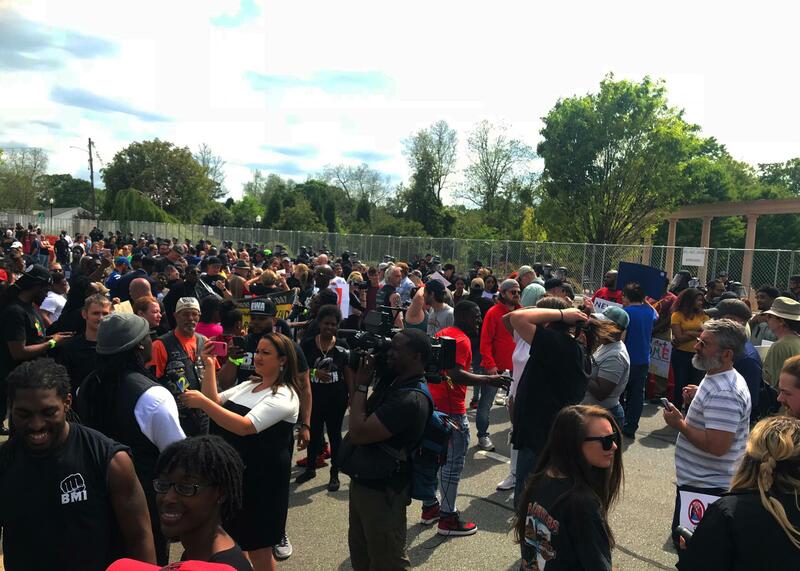 Georgia State Patrol in riot gear maintained a 75-yard barrier between the opposing groups, reinforced by high chain link fencing. 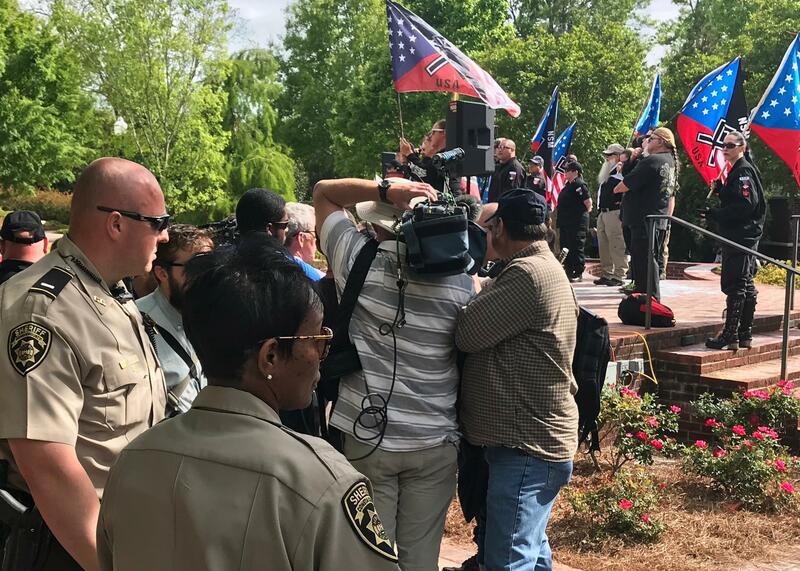 Only credentialed members of the press and police were allowed inside the park to watch speakers from the National Socialist Movement and the League of the South trumpet white supremacy. 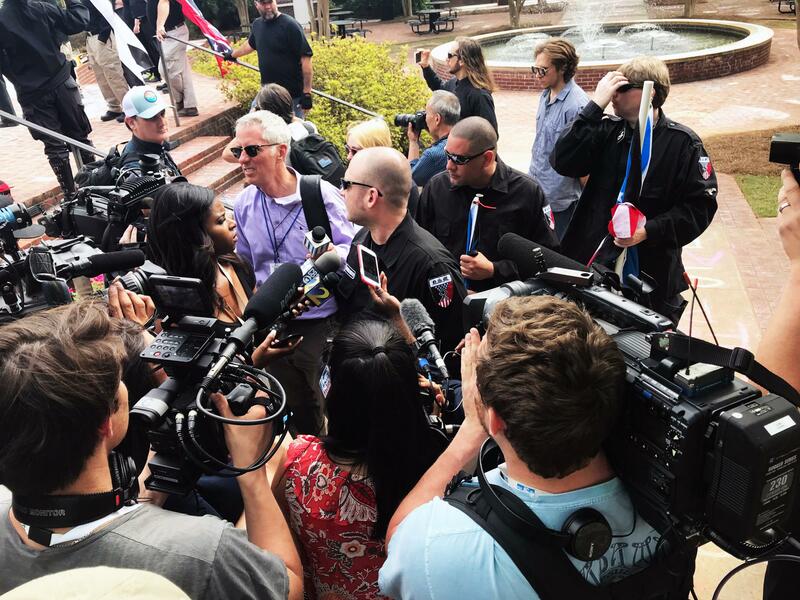 At least one reporter tweeted he was kicked out at the request of a rally organizer. Shortly after 5 p.m., officers with megaphones said the rally was over, and everyone had 10 minutes to leave. Just like that, crowds dispersed and quiet returned to Newnan.